JSC Kazakhstan Aluminium Smelter have chosen BCT as the Technology Provider for their new Carbon Plant in Pavlodar. 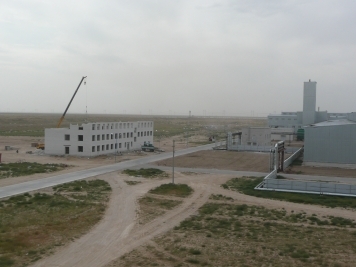 JSC Kazakhstan Aluminium Smelter (KAS) has chosen BUSS ChemTech AG (BCT) as the technology provider for its new Carbon Plant in Pavlodar. 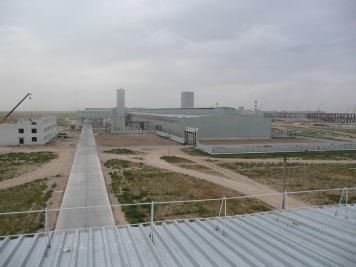 The plant should go into operation end 2010. BCTs scope of services covers the technology package including basic, detail engineering and delivery of main equipment for the fully continuous process including raw material processing, green anode plant, baking furnace and anode storage and also gas treatment center, warehouse, maintenance shop, auxiliaries and infrastructure. BCT is proud to be nominated as technology provider as this Carbon Plant is a fully integrated continuous process and the first of its kind. Several factors create major improvements which will lead to a stable quality of the anodes, optimally adapted to the needs of the electrolysis. The new direct feed of calcined coke into the process avoids additional intermediate tanks where quite often segregation of the fractions occurs with the result of fluctuating product quality. It further allows reduction of the number of fractions. A further important factor of the production line is the “just in time” generation of fines by means of a vertical ball mill. All these improvements help to reduce the number of equipment, which simplifies the line, increases the operability and reduces the investment significantly. The anode paste is produced in the well known Horizontal Paste Line consisting of the 3 pieces of BCT equipment: the hollow flight Preheater, the newest Paste Kneader and the Horizontal Paste Cooler with a nominal capacity of 150'000 MTPY. The paste is formed by a state-of-the-art hydraulic press to produce anodes of highest density. This press design in corporation with a leading European press manufacturer may be the beginning of the renaissance of such technology in the Aluminium world. Pitch fumes from all sources will be collected and delivered to a Regenerative Thermal Oxidizer (RTO) which guarantees the most effective treatment of these vapours. The closed process eliminates the dust in the air significantly as all air is collected and filtered in several units to ensure healthy working conditions for the staff and ensures that the exit air is dust-free and supports the high environmental responsibility. The responsibility for the baking furnace has been transferred to Riedhammer GmbH in Germany. Under the control of BCT they will be responsible for the engineering, the delivery of the key equipment as well as the brick works of the furnace including fume treatment. KAS Carbon Plant provides innovative solutions, an easy and safe operation, the outmost protection of the environment combined with reduced investment costs, raw material and energy savings which all together leads to maximised clients benefit. BUSS ChemTech is proud to be partner of KAS for this Carbon Plant project and is consequently taking the overall responsibility to warrant a successful project which will become a global reference for the new technology.